The distinct styling of a Nissan Cube is very unique. The term “Cubism" is most often used in describing a particular art form; however, in the case of this Nissan model, it is the perfect description. The egg-like shaped windows and asymmetrical rear glass pane are two examples of this. The interior affords ample headroom and legroom for the passengers, sacrificing a wealth of cargo room in the process. This vehicle’s target audience would most likely be an individual, couple, or small family. 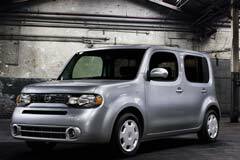 The Nissan Cube was offered with a smooth running 4 cylinder engine and either a manual or continuously variable transmission. There are three different models to choose from: the S, SL and KROM. The Nissan Cube is a compact, practical choice for everyday use while offering unique styling. This vehicle has proven reliable through the years. Additionally, with today’s gas prices, it makes economical sense as well. The purchase of a pre-owned wagon such as this is a good alternative to that of a new and more costly minivan.